On the Doghouse, hit the 4th race quinella for $8.70 multiple times. Hit the $1 superfecta in the 7th for half of $524. Hit the triple in the 8th for half of $101. In the Pk3 using the TicketMaker sheet, I was live in the 10th race Hopeful to five horses. But I was not at all confident that I would win, even with five of the twelve horses. That is how difficult that race was. My payoffs were half of $160 to around $800 for the five horses. Luckily or unluckily the favorite won and paid half of $172. I did not have the second or third horses, so I was very happy to hit it even though the payoff was small. I did make a small profit (less than $100) for the day. It was a losing season, but the weather really was superb in the last couple of weeks. 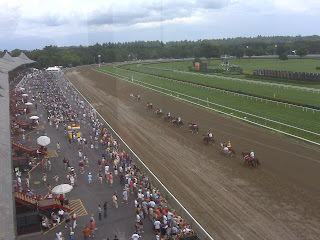 Win or lose, Saratoga is really something special! I have posted the last Saratoga Doghouse. Go to Meet Mr. X and click on the red button or go to the Racing Calendar. Hit a few yesterday but still lost! Pk3 today could be big. Feature in 10th race is very tough. I have posted the Doghouse for Sunday. Congratulations to Rachel Alexandra. She really showed everybody that she is something special. Not doing very well at all, so you have been warned. All week when I have picked some good horses, I can't seem to bet them right. Then I started to lose all of the photos. Yikes! In any event, only two days lefst so have fun! I will post a Doghouse for Sunday, but I am warning you that I am snakebit. Not doing well, and losing all the photos. I have posted the Doghouse for Thursday. Too many turf races, but the weather will be great for the remainder of the meet. On Sunday's Doghouse, out of six races, we had four winners on top and two second choices. Still managed to lose money. As always, go to Meet Mr. X and click on the Doghouse Confidential red button or go to the Racing Calendar.